^ 不平等条约的废除和平等新约的签订. 《近代以来重庆100件大事要览》. 2007年1月21日. （原始内容存档于2014年12月13日）. ^ Elleman, Bruce A. (1998). 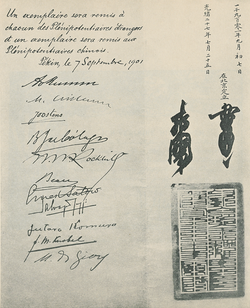 Diplomacy and deception : the secret history of Sino-Soviet diplomatic relations, 1917-1927. Armonk (N.Y.): M.E. Sharpe. p. 144. ISBN 0765601435.